Located just 50 miles east of Nassau, Eleuthera is a long and thin island, 110 miles long and averaging about 1 mile wide and has a population of just under 8,000 but it is the 4th most populated island in the Bahamas. Eleuthera comes from the Greek, meaning “Freedom” and its suitable for the laid back relaxing island. The architecture and lifestyle in Eleuther & Harbour Island were inspired and steered by the British loyalists from the colonial times in the 1700s. Eleuthera boasts pristine pink sand beaches, jagged cliffs, secluded coves, endless pineapple fields and miles of coastlines. 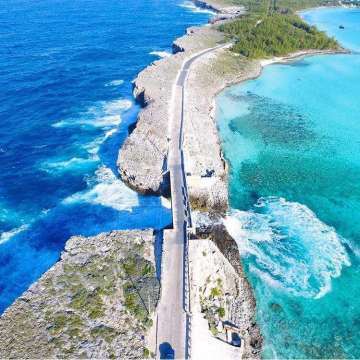 One of the most visited spots of Eleuthera is the Glass Window Bridge, where the deep dark blue bustling Atlantic ocean meets the turquoise calm Exuma Sound (Carribean sea). Other popular natural attractions include Hatchet Bay Caves, Surfer’s Beach, Ocean Hold and Lighthouse Beach. Eleuthera is well-known for its pineapple farming which began in the mid 18th century and they honor this by having an annual Pineapple Festival in Gregory town in June of every year. Pink Sand Beach is found on Harbour Island which is a small island off of Eleuthera measuring 3 miles long and ½ mile wide. However, pinks sand beaches are seen over 35 miles of beach. Eleuthera is a destination for those interested in history and nature with a serene lifestyle!